This is Aarohi's Hermione, made using Dawn Toussaint's Hermione pattern. It took me all of three years to get this done. I started with a white + blue (like Dawn’s) sometime in 2013. By the time the 4 cones (arms + legs) were done, 3rd trimester fatigue had set in and that’s how the money goes, pop goes the weasel LOL!! Finally when I did get back to the project last week, I decided to change colors and have pink be part of it since my 3yo daughter loves pink. Surprise, right?! 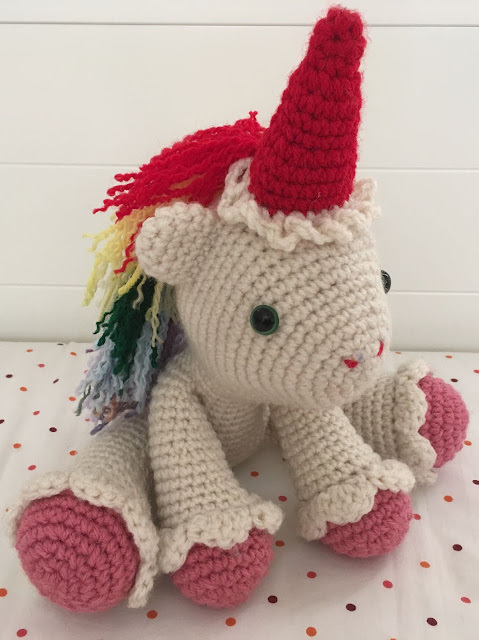 Just finished it, added mane and tail in rainbow colors because rainbows! I think the red yarn for the horn was heavier than the yarn used for the body, so the horn is a bit too large, so this Hermione is extra magical! The intended recipient loves it, can say “Hermione” and tells everyone “my mom made it!”.